A Japanese tank in World of Tanks. When I doodled war scenes as a kid, they always featured some elaborate tank. Obviously riding what was essentially a giant gun was the best way to be on the front lines of a battle. Free-to-play MMO World of Tanks captures some of that childhood excitement. I’ve been playing it since 2015, and it’s just as exciting today as my very first battle—possibly even more. Because all tanks have augers and glass cockpits...right? World of Tanks, which first came out in 2010, lets console and PC players command models of real-life historical tanks, crashing through buildings, shooting cannons, and causing general mayhem in a team-based atmosphere. Your hangar of tanks contains one tank from each of the nine real-world nations currently represented in the game. Though you don’t command people in the game, each tank can be equipped with crew members who learn skills that aid your gameplay and who can be moved between tanks. Battles take place on randomly-selected maps. Your initial battles will be against AI tanks on the Proving Grounds, but before long you’ll be facing off against teams of 15 other players. Battles in World of Tanks have a maximum time limit of 15 minutes and are contested until either all of the enemy tanks are destroyed, a flag is captured/defended, or until time runs out. I have found that most matches run 8-10 minutes. A pretty good survival rate is 25%, so don’t be frustrated by getting blown up often as you learn the ropes. World of Tanks has a small training module that covers the basics of the game, such as movement, firing, and armor penetration. But the tutorial can’t cover all the nuances of the game’s mechanics. You’ll have to do some additional research to uncover information on how to truly master this game. For instance, there’s a very informative wiki for the game, and YouTubers such as Quickybaby and LemmingRush offer casual but informative content that will have you up to speed in no time. Welcome to your hangar/garage, your non-battle interface. Tanks are grouped into branches, each having 10 levels (tiers). They evolve as you progress upward through a branch, from Tier 1 to Tier 10. There is no skill-based component to the matchmaking. Every public battle except Tier 1 gives each side a mixture of the various classes and tiers of tanks (at Tier 1, players face off against other Tier 1 players). Generally, the random selection of players works out so each player ends up with a comparable enemy on the other side. Victory favors the team that works together, and the diversity of people interested in World of Tanks makes this even more worthwhile. In any given match your teammates could range from history buffs and tank aficionados with limited gaming experience to top-level players involved in the World of Tanks esports scene. There are five classes of vehicles, each with their own style of play. Light Tanks are what you start with at Tier 1; medium tanks, tank destroyers, and self propelled guns (SPG or artillery) become available at Tier 2. Heavy tanks start to become available as low as Tier 3. All of these different vehicles are further influenced by general qualities and defining characteristics from their different nations. The tremendous number of variables that apply to every tank means there is a tank out there for every playstyle. Some tank lines are slow and heavily armored, while others are nimble and fast at the expense of protection. Each tank has a cannon, but some are better than others in terms of rate of fire, damage per shot, turret speed, and the elevation/depression angles of the gun. Each tank has a balanced mix of strengths and weaknesses. There is no such thing as a tank that is fast, well armored, has an abundance of hitpoints, and a gun that outclasses its opponents. It’s an exciting challenge: a good player can play to a tank’s strengths and minimize its weaknesses. The Czechoslovakian research tree is...straightforward. After getting a few battles under your belt and earning some XP, it’s time to dive a bit deeper into the hangar and check out the tech tree. A tree branches from each tank that lets you spend your XP to upgrade your tank and advance to its successor. Developer Wargaming has made a lot of effort to create lines of tanks that follow consistent evolutionary trends and attributes with minimal deviations in playstyle and historical accuracy. They also utilize tanks that were really manufactured or existed in a blueprint form in the mid-20th century. This creates some stunning visual models for players to enjoy. Checking out the branches of the research trees reveals the magnitude of possibilities. World of Tanks has 350+ vehicles in 39 distinct tank lines. Let’s dive a bit deeper and learn more about the different classes. A medium tank works with teammates in heavy tanks to overtake a strategic position. Screenshot from LemmingRush. Tanks are the namesake of the game, and they make up the majority of the game’s population. These are spread over light, medium, and heavy varieties. Generally speaking, a heavy tank will be physically larger and have relatively more armor, allowing it to deflect or absorb more hits than other vehicles at its tier. A light tank will be fast and nimble in exchange for virtually no armor, relying on evasion to avoid damage. Light tanks generally have the weakest gun in terms of damage, and heavies usually have guns capable of dealing the most damage. Mediums fall somewhere in between. However, these are only general descriptions. There are so many different variables that apply to each tank to give them their own distinct flavor. Tank destroyers are a more specialized class. They often look very different from tanks because they may have their gun mounted in the hull as opposed to being in a turret. This makes them less flexible compared to tanks. They usually sport the best guns available in their tier, but to compensate they often lack armor and are easily flanked due to lower maneuverability. Two Tank Destroyers, an SPG, and a heavy tank moving away from their spawn points while the rest of their team disperses in the background. This image is from my low-end potato laptop, so your graphics might be much better. Artillery has significantly different gameplay from the other types of vehicles. These vehicles generally aren’t very mobile and take a long time to aim and reload. They use a completely different aiming mode than the other vehicles, and they are practically helpless when an enemy gets too close given their diminished close-range accuracy. However, a solid hit from an artillery shell can devastate an enemy. A skilled artillery can dictate the result of a battle, especially when the artillery’s splash range has the potential to take out multiple tanks at once. The British research tree is robust and interconnected. World of Tanks is free-to-play; there are microtransactions, but it isn’t pay-to-win. Individual battles and gameplay are not directly modified with money. Spending your hard-earned currency primarily translates to two things: various utilities that will save you time (through increased XP earning/conservation) or Premium Tanks (which are endowed with increased XP and credit earnings, and cannot be acquired by simply grinding tanks). Essentially, spending real money makes grinding to the top tiers easier, but players aren’t obligated to spend real money to get there. You can also spend money to buy premium shells, which will generally have a greater penetration value than your standard shells, but you can buy these with credits you earn in-game too. There are also Reward Tanks, which generally don’t have the credit-earning perks of premium tanks, and must be earned rather than purchased. Some Premium Tanks can even be earned through in-game events. All of this means spending money is never a requirement. Peeking through some transparent foliage to take some shots at an exposed medium tank driving across open ground. In addition to the benefits of being free-to-play, World of Tanks’ low technical requirements make it accessible to a wide range of players. I perform above average in this game on a 4-year-old low-end laptop; a more powerful computer and fancier equipment would certainly make the game much prettier and more immersive, but it would not suddenly make me skyrocket to the top of the player rankings. 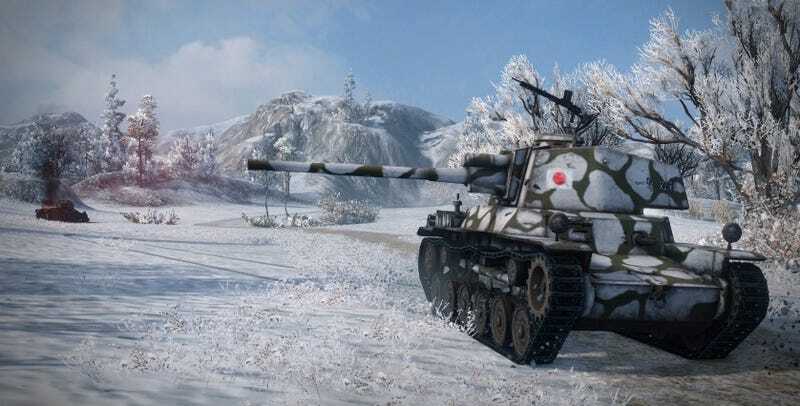 The game has seen some pretty significant growth over the years, which keeps it feeling fresh for old players and attractive for new players.Wargaming is continually improving World of Tanks’ audio-visual capabilities, even to the point of modulating the sounds depending upon the size of shell hitting your tank (a 150mm shell sounds different than a 76mm, for instance). New tanks are introduced regularly, maps are constantly being modified or added, and every patch brings a round of buffs and nerfs to work on maintaining a balance for every tier. I’ve come to love World of Tanks. It doesn’t cost me anything, the visual models appease the inner history nerd in me, and it is varied enough to allow for lots of play without feeling repetitive given the diversity of tanks. But most of all, World of Tanks requires me to focus and think in order to play well. There are different strategies for every tank and map, and each enemy has particular ways to be approached and defeated. The composition of the two teams impacts strategy, and battles evolve in such a way that you need to be aware of the entire battlefield as well as your immediate vicinity. Even the way you load out your crew skills, tank modules, equipment, and consumables can have big impacts on your game and ability to succeed. Take all of these variables and combine them with unpredictable human element, a wide variety of technical mechanics, and a splash of RNG, and you’ve got a recipe for a game that you can play almost without end. David Allen is a Testing Engineer from Virginia who loves cars, gaming, and bicycling.